Tuscany emotes visions of the Italian countryside replete with gently rolling hills of a splendid and unspoiled countryside – including cypress, oak and olive trees. Stone houses with clay tile roofs – and inside those homes, an inviting, comfortable and cozy place to be and live. This is why so many North Americans are looking for some Tuscan styling in their own homes. Who wouldn’t want to look out a kitchen window and see rolling hills of countryside? Well, maybe we can’t get those rolling hills but, we can achieve some of the Tuscan look inside our homes. 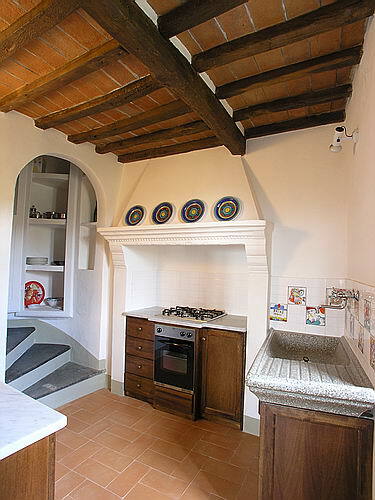 Today, I will be focusing on Tuscan Kitchens. 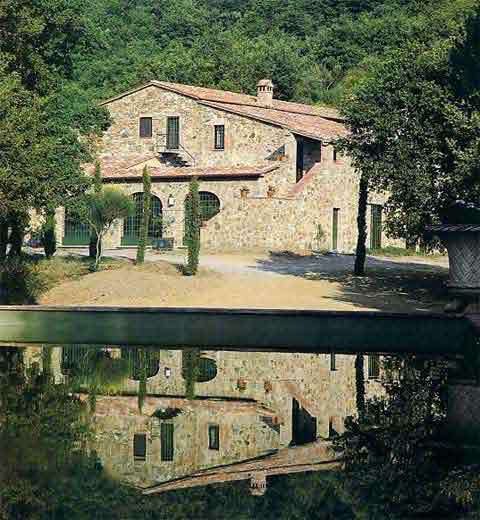 Tuscan style is Italy’s version of country – Italian Country. I suppose we have our own country style in North America but, it is more likely to include ducks, flowered wallpaper or borders, wreaths and pine furniture which are usually new and they all match. Tuscan style or Italian country is an adlib, 'au naturel' style – a style you must be able to accept if you want to adopt this style in your home. Furniture does not need to match and it should be old or worn. Elements of the kitchen should be very natural – stone floors, wood furniture, brick or marble fireplaces, clay tile countertops and backsplash, plaster walls and solid wood beamed ceilings – just a few of the elements you might find in a Tuscan kitchen. It all makes for a natural and comfortable environment – as if everything was meant to be there – and the materials were taken straight from the countryside. Now if you are lucky enough to have stone walls, GREAT! However, this is something most of us will not be able to achieve naturally. There are ways to achieve this look. You can buy faux stone products, which install similar to half brick walls (which are a lesser expensive alternative to full brick walls). "I can afford it" Tips: An even less expensive method, not to mention easily changeable (something I always like to implement in my designs), is painting faux stone or marble walls. A faux stone block wall can be done in different configurations, shapes and colours for a personalized stone look. 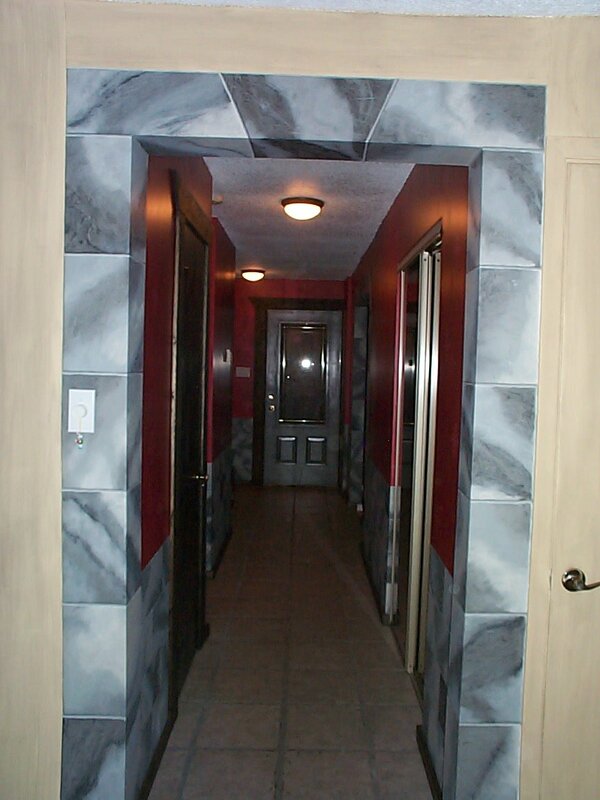 In my previous house, I faux painted stone blocks in my front hallway and around the archways. There wasn’t a person who came into my house who didn’t say, "WOW, look at the walls" and of course, they had to touch them to see if they were real! Plaster walls are also found extensively in Tuscan homes - usually in a creamy grayish white colour. Venetian plaster can be purchased just about anywhere these days and is easy to apply. In a Tuscan kitchen, there is a lot of wood - stained on the darker side. Not only is there a lot of wood but, none of needs to match. An armoire can be different than the shutters, which can be different than the wood cabinets, which again can be different than the table. I love it! Here’s a time when you can take advantage of your mismatched pieces. Maybe you have an armoire in your bedroom that you could use? Maybe you have some old chairs in your attic or barn? Maybe your mother has an old farmhouse wooden table that is now too big for her and is looking for a new home? If you have always loved the Tuscan theme, I am betting that you have some pieces tucked away that would work well in your new kitchen design. A farmhouse wooden table is a must. 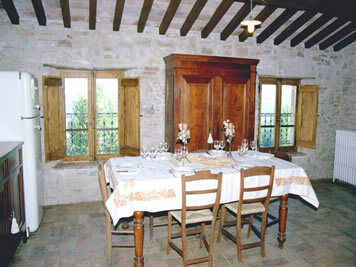 Chairs are also wood with rush seats - a great choice for this 'au naturel' Tuscan kitchen. "I can afford it" Tips: As I have done in the past, I used 4 un-matching chairs - a look that gives the room an automatic air of hand me downs from generations. They were all antiques and had somewhat similar lines. I also recovered the seats in similar fabrics. It gave a real homey, cozy feel to the kitchen. Everyone was able to pick their favourite chair - kids and adults alike loved that concept - just part of the charm of a Tuscan themed decor. In order to get a true Tuscan kitchen look, cabinets will be unfitted. I know that this is not something a lot of people can live with, even though the look is fabulous. It is also, more importantly, something not everyone can achieve inexpensively. If you are redecorating or redesigning your kitchen, then it can be done. "I can afford it" Tips: For those really brave out there, remove some bottom cabinet doors to reveal your great looking pots and pans - preferably copper. "I can afford it" Tips: If you can, fit an armoire in your kitchen to achieve that fabulous Tuscan feel - not to mention additional storage. Tuscan kitchens should include some black wrought iron. This could be in the form of a black iron pot rack or how about a wrought iron chandelier or light fixture. Both or either would work beautifully. 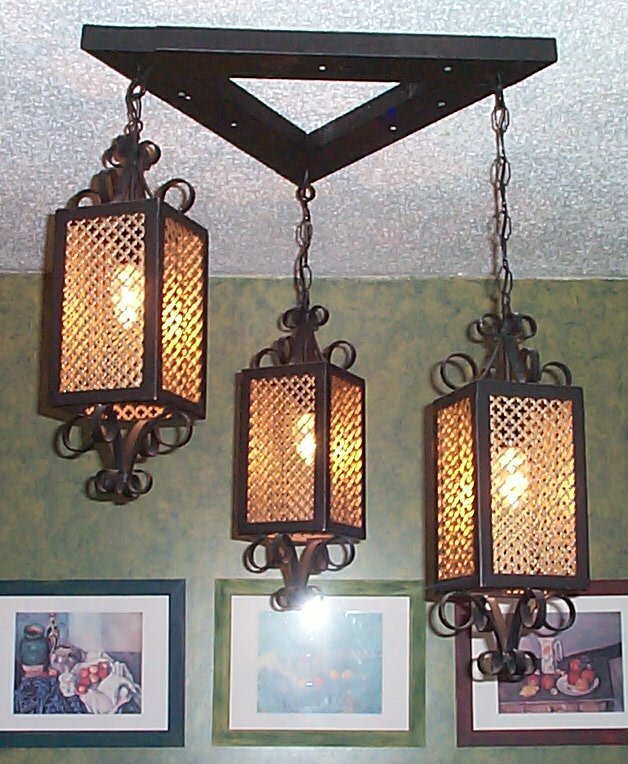 "I can afford it" Tips: If you don't have a wrought iron light fixture, consider spray painting the one you have in a solid black to give the look of cast/wrought iron. "I can afford it" Tips: To get a unique, old world pot rack, consider an old wrought iron fence gate. You may find these at antique dealers, salvage stores or even new fence contractors. Flooring is also 'au naturel' as well - being either stone or tile. Choose a natural flooring material such as marble, clay tile, slate or stone. "I can afford it" Tips: If this is not an option or out of your budget, try to find a ceramic or porcelain tile resembling any of these products. There are a ton of great looking, affordable ceramic tiles on the market. They can even be found at your local hardware store. A Tuscan kitchen will look wonderful with a hammered copper range hood. "I can afford it" Tips: If you can't do this, how about painting your current range hood with a high heat copper paint (just the outside). Even better, take a hammer to the range hood first to give it a 'hammered' finish, then paint it copper. Voila - a hammered copper range hood. "I can afford it" Tips: If the copper range hood is out of the question, get some copper in your kitchen with some copper accessories or a few copper pots and put them on display. An easy way to go Tuscan is to add some Tuscany-styled dishes, plates, bowls and more. Find some dishes - tomato red, olive green and sun-burnt yellow - perfect for any Tuscan kitchen. Other accessories to add are glass jars filled with pasta, decorative containers of olives and olive oil. And last but, not least, to finish the look, a bowl of grapes on the table - fresh from the vineyard. Enjoy your new Tuscan kitchen!